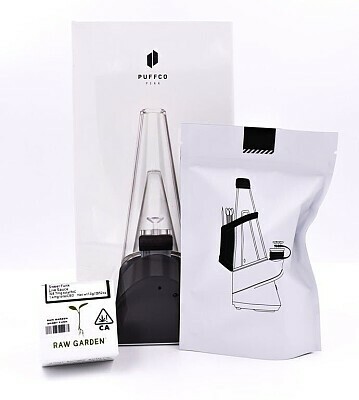 The PuffCo package contains a PuffCo Peak Smart Rig, a PuffCo Peak Travel Pack (contains: splash cap, backpack, carb cab tether, and atomizer cover), and a 1g Raw Garden Sweet Funk Sauce. 4/20 Raffle by Empire Health & Wellness: You can buy as many tickets as you wish to increase your chances of winning. There will be 5 winners (5 prizes total). The drawing of the tickets will be held on 4/20 in-store. You are not required to be present to win a prize. First ticket drawn picks what prize they want, then second ticket gets second pick, etc.